The English curriculum at Denbigh strives to equip children with the reading and writing skills that they will need to succeed in, and beyond their school years. We use a variety of teaching and learning skills to support our children’s learning throughout the English curriculum which encompasses reading, grammar, spelling and punctuation as well as composition of written texts. Our staff aim to enthuse and inspire a love of English through relevant texts, exciting writing opportunities (which lead to a real-life outcomes, such as presenting their work on the School Radio, or uploading their work to Seesaw so that other children can read it) and through genre based studies. A genre based study allows our children to build a solid knowledge of different text types; building on this knowledge each year through the introduction of new language features and presentational devices. With a few consecutive weeks being spent on each text type, the children have a good base to then show off their skills through HOT writes which follow after each genre study. A cross curricular approach to English is in place to allow children have the opportunity to apply the skills learned in English lessons through other areas, such as STEM, Topic, Art, DT etc. 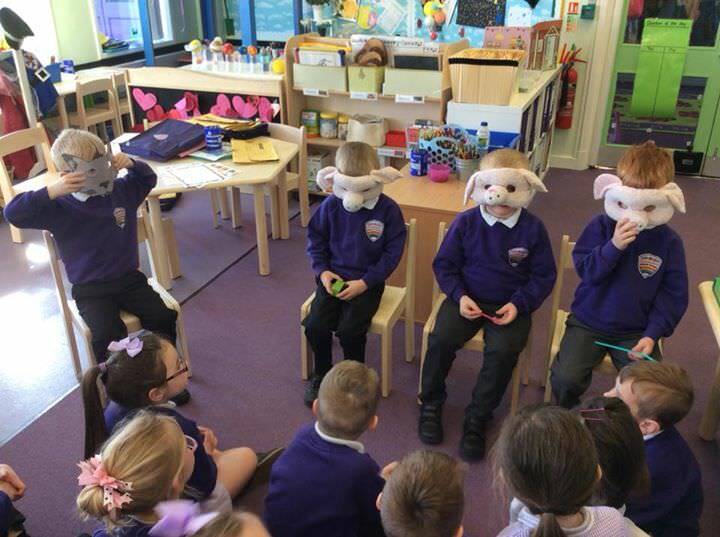 Educational trips (writing events, library visits, author events and cinema trips) work alongside our English curriculum to support the teaching and learning, and give children real-life experiences to draw on in their writing. In KS1, children learn to read using the Read, Write, Inc. phonics scheme alongside whole-class daily Guided Reading sessions in which the children are probed on their understanding of a text and its grammatical features. In KS2, children continue to build on their reading skills through structured Guided Reading sessions which teach key skills and probe children’s understanding. Alongside this, we use Accelerated Reader to give children the opportunity to delve into new books independently whilst building reading speed and fluency. Throughout all strands of English, ICT is used to engage, enthuse, present and document the children’s learning. Children are talking, laughing, engaged and enjoying English through a range of interactive and practical activities. Children are actively involved in their own learning, asking questions, looking for the answers and planning their own writing. English is differentiated and inclusive with children making progress throughout the lesson and genre study. The dinos are working together to edit and redraft their hot write. They love getting their hands on the green “teacher” pens.